Green tea is tea made solely with the leaves of Camellia sinensis that have undergone minimal oxidation during processing. Green tea originates from China and has become associated with many cultures in Asia from Japan and South Korea to the Middle East. Recently, it has become more widespread in the West, where black tea is traditionally consumed. Many varieties of green tea have been created in countries where it is grown. These varieties can differ substantially due to variable growing conditions, processing, and harvesting time. Over the last few decades green tea has been subjected to many scientific and medical studies to determine the extent of its long-purported health benefits, with some evidence suggesting that regular green tea drinkers have lower chances of heart disease and developing certain types of cancer. Although there is no scientific evidence that plain green tea can produce weight loss, a green tea extract rich in polyphenols and caffeine has been shown to be useful for "obesity management", since it induces thermogenesis and stimulates fat oxidation. Fill the kettle with fresh water and bring to a boil. Keep aside to cool for 2 to 3 minutes. 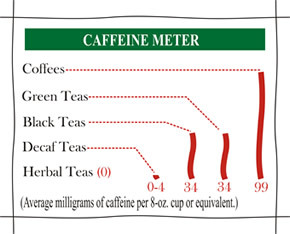 (Green tea requires cooler water than black tea to avoid "cooking" the delicate leaves and extracting any bitter flavors). Warm the tea pot & spout by swirling in a splash of the steamy water, then pour it out. Place one tea bag per cup. Pour the water over the tea bag, cover & allow steeping for 2 to 3 minutes, (trying tasting a small amount of the tea at 30 sec intervals after the first minute to find your favorite brew). Traditionally Green tea is served without milk.